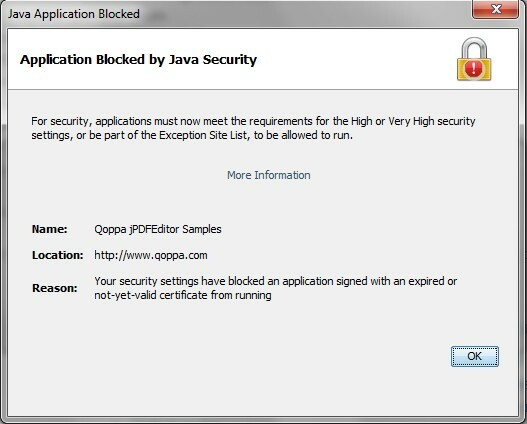 Q: When I try running a Java webstart application or applet using one of Qoppa’s library jars, the application is blocked by Java Security due to an expired certificate. Can you help? Starting in v2015R1, Qoppa started signing jars using time-stamps from a time-stamp server authority. Previous versions of the jars that were not time-stamped from a server authority will show an expired certificate warning after the certificate expires. If you wish to continue running an older versions of Qoppa’s jars, you should remove the signature on the jar and then sign the jars again using your own code signing certificate. All jars in the classpath should be signed with the same certificate. If you need help, contact us. The error above may show when running a web-start application with an older version of Java 1.8, for instance Java 1.8 update 73. After upgrading to the latest version of Java 1.8 Update 101, the warning should stop showing and the web-start application should no longer be blocked. How can I remove a signature from a signed jar file / How can I unsign a jar? Are Firefox, Google Chrome Right to Block Java Plugin?